This extension contains tasks that can be used to manage Rust projects. Rust is a systems programming language that runs blazingly fast, prevents segfaults, and guarantees thread safety. For more information on Rust, take a look at the official documentation. The extension adds the Rust Tool Installer task inside the Tool category. It installs rustup and the latest version of the Rust toolchain. Always ensure you have run this task first, others need it to run. 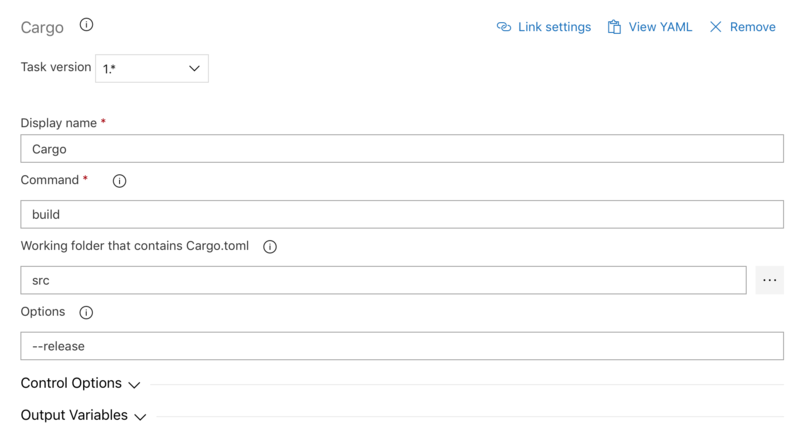 Cargo task is available in the Build category. Command: Cargo subcommand to execute (example: build, test, update, install, doc...). Working directory: Working folder that contains Cargo.toml (optional). Those tasks can be used in the same way as the Cargo one. You've got a feature request? You found a bug? Don't hesitate to create an issue on github! You can also ✍️ a review!